There's a new way to save even more on your favorite duplication products and supplies from CDROM2GO! 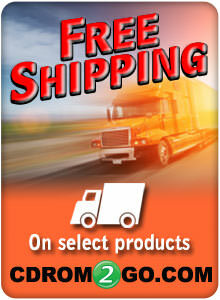 Just look for items with the free shipping truck image on the page to enjoy FREE ground shipping* on that item. This is a great way to save money on items that you purchase frequently or in large quantities. Are there any restrictions on this offer? Free Ground Shipping is only available on CDROM2GO items where the free shipping icon is displayed. *Offer is valid only for items shipped within the Continental United States. Alaska and Hawaii residents may be subject to additional shipping and handling fees (please call for details). How many items are available with Free Shipping? Over 150 items in our product catalog include free ground shipping. How do I receive the Free Shipping discount? Simply add the selected item to your cart. The Free Shipping discount is automatically applied to your order during the checkout process. CDROM2GO also offers 2-Day, 3-Day, and Overnight shipping for an additional fee. Shipping rates vary by item so please contact a sales representative for an updated price quote. What about products without the Free Shipping icon? Standard shipping rates apply to products without the free shipping icon. Most orders ship the same day they are placed. After that, items are delivered within the standard UPS Ground transit times. Where can I track my order once it has shipped? Simply enter the tracking number from your confirmation email on the UPS Tracking page to view the status of your shipment.